Background: Laparoscopic cholecystectomy (LC) has established itself firmly as the 'gold standard' for the treatment of gallstone disease, but it can, at times, be associated with significant morbidity and mortality. Existing literature has focused almost exclusively on the biliary complications of this procedure, but other complications such as significant haemorrhage can also be encountered, with an immediate mortality if not recognized and treated in a timely manner. Materials and Methods: Publications in English language literature that have reported the complication of bleeding during or after the performance of LC were identified and accessed. The results thus obtained were tabulated and analyzed to get a true picture of this complication, its mechanism and preventive measures. Results: Bleeding has been reported to occur with an incidence of up to nearly 10% in various series, and can occur at any time during LC (during trocar insertion, dissection technique or slippage of clips/ ligatures) or in the postoperative period. It can range from minor haematomas to life-threatening injuries to major intra-abdominal vessels (such as aorta, vena cava and iliacs). Conclusion: Good surgical technique, awareness and early recognition and management of such cases are keys to success when dealing with this problem. Bleeding complications are an important subset of these 'non-biliary' injuries, and they can cause mortality right on the operating table if not recognized and treated in time - they are the most frequent cause of procedure-related mortality in LC (after anaesthesia-related deaths) , and yet surprisingly have not been studied comprehensively despite having been reported frequently. A search was made serially through the internet (Google and PubMed) using the key words laparoscopic cholecystectomy AND complications, bleeding, vascular injury, aorta, vena cava, portal vein, cystic artery and liver bed. The results obtained were further refined to give hits only for human subjects, English language and clinical reviews, meta-analysis and practice guidelines. The abstracts thus obtained were scanned to ascertain their significance to the search in question, and the full texts of any such articles thus referenced were obtained. Further refinement of the results was performed by cross-referencing from the bibliography at the end of the articles that were found to be related to the subject of vascular injuries in LC. Once this basic framework was obtained, further searches were conducted into the individual facets of such injuries, such as laparoscopy, trocar-related complications, major-vessel injury, and the various risk factors that have been reported in literature. The full texts of all such articles relevant to the problem being analyzed were accessed. A few texts that could not be procured were analyzed from their abstracts, and any relevant information within was included. A large volume of data exists on various aspects of LC in available English language literature (nearly 10,320 articles; Pubmed last accessed on 26 th April 2010), and as such, it does not seem possible that any search on any aspect of the procedure can be truly 'complete'. However, having refined the search patterns repeatedly and having cross-referenced various studies, the results obtained do seem to be representative of the problem of bleeding encountered in relation to LC, although they should not be considered complete. The results of single-centre series of LC that have reported more than 1,000 cases in the last decade are tabulated as [Table 1], ,,,,,,, and multi-institutional studies and surveys with more than 5,000 patients analyzed are tabulated as [Table 2]. ,,,,,,,,, Although various series have mentioned bleeding as a significant complication and a major cause of morbidity and mortality in LC, there seem to be no major reviews on this topic. Postoperative bleeding is also important but poorly documented, ranging from minor haematomas to significant bleeds (missed operative injuries, slippage of clips) that require re-operation in quite a few instances. Surprisingly, very few authors have actually detailed their incidence, site and management while reviewing their data on LC. Again, it is interesting to note that there seem to be no definite criteria mentioned in literature to label a bleed as significant or major in the postoperative period. Although LC has firmly established itself as the procedure of choice in gallbladder disease, at times, it can be associated with severe and potentially lethal complications that can be a test of patience and surgical skill even for the most experienced of surgeons. These complications can be conveniently divided into the biliary and non-biliary groups, and the majority of these are operator dependent and largely preventable. The classical injuries seen, described and taught are those of the biliary tree, and these have received much attention in literature. However, as a rule, these injuries are not immediately fatal but tend to produce 'biliary cripples' who suffer from all the attendant complications of cholestasis and disruption of the normal bile pathway. In contrast, the so-called 'non-biliary' complications, such as bleeding, bowel injury, injury to other intra-abdominal structures, or pneumothorax, have the potential for immediate fatality if not diagnosed and treated in a timely manner. 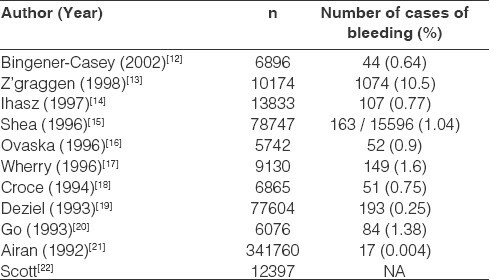 Various factors have been implicated in literature in the causation of bleeding [Table 3]. ,,,,,, There seems to be no single definite cause that can be established with certainty, but the surgeon-related factors are the most important, strengthening the importance of proper training and accreditation in LC. Surgeons who had operated less than 100 cases have been reported to have a higher rate of bleeding complications, , which tapered off after adequate experience had been gained; this probably represents surgeons who have had some training in their first few cases and have then started operating independently. However, this is not an absolute law, and one can face such a problem at any stage of one's career. In fact, it has been observed that even the presence of adequate operating experience does not reduce the rate of bleeding complications, with Schafer et al. reporting a higher rate of complications in surgeons who had operated more than 100 cases! 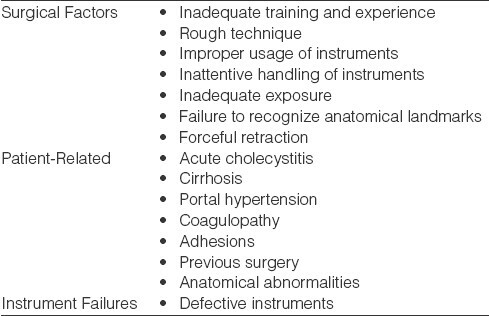 Various factors such as improper technique, inattentiveness, improper handling of instruments and inability to recognize the relevant anatomy contribute to the occurrence of bleeding complications at any level of experience. Previous abdominal surgery, anatomical aberrations, adhesions and sharp dissection may also be associated with a higher incidence of bleeding complications. Bleeding in LC can be encountered intra-operatively or in the postoperative period. Intra-operative bleeding usually falls into one of the following four patterns: vessel injury, slippage of clips/ ligatures of the cystic artery, liver bed bleeding and miscellaneous. The risk of vascular injury is less for the secondary trocars, as they are placed under vision. However, bleeding from the abdominal wall (epigastric vessels) can be troublesome and can be avoided by transillumination of the abdominal wall and by observing penetration of the trocars through the telescope by keeping the tip of the instrument in view throughout. The inferior epigastric vessels usually lie near the lateral border of the rectus sheath, and proper placement and direction of the trocars helps in avoiding damage to them. Dissection during LC, especially within the Calot's triangle, can also lead to a significant bleed if the right hepatic artery or the portal vein is injured. This can happen especially when the anatomy is distorted or unrecognized, and when there is persistence in using sharp dissection in a difficult Calot's. The right hepatic artery is more commonly injured, but the portal vein can also be injured,  leading to significant bleeding and the risk of biliary injury because of blind attempts to control the bleeding. Not being able to recognize the extent of injury and delaying conversion in such a situation definitely contributes to increasing the morbidity and mortality of the procedure. Cases of bleeding because of slipped clips over the cystic artery and from the liver bed are also frequently encountered and can be troublesome enough to necessitate conversion to open procedure. Similarly, bleeding from parenchymal injuries to the intra-abdominal organs during retraction can also be the cause of much disconcert to the operating team, forcing conversion in an otherwise successful cholecystectomy. In the postoperative period following LC, bleeding can manifest as either an internal bleeding (consequence of an intra-operatively missed vessel injury, from slipped clips/ ligatures over the cystic artery, or from the liver bed) or external bleeding (from the port sites). External bleeds usually manifest after surgery, with soakage of dressings or visible bleeding from port sites, and may require reoperation to salvage patients who do not respond to conservative measures. For patients having internal bleeding, it is difficult to establish the site of bleeding, and such patients may need re-exploration for its control. Surprisingly, despite there being a large volume of data on LC in literature, not much is available on the incidence of postoperative bleeding after LC, the indications for operating such patients, and the operative findings. Persisting pain, tachycardia, fall in haemoglobin and blood pressure and obtundation should alert one to the possibility of bleeding even in the absence of external bleeding, and these patients need to be evaluated carefully for their response to conservative means and the need for surgery. Standardization of the definitions of bleeding in relation to LC may help in defining the exact incidence of such complications in a better way, and a suggested simple classification system is shown in [Table 5], wherein the bleeding complications are divided into major and minor depending on the need for conversion, additional surgical procedures, or blood transfusions. Thus, any bleeding that requires a laparotomy is major, irrespective of the vessel injured or the timing (intra-operative or postoperative). Similarly, any bleeding that needs additional surgical procedure (wound exploration and ligation of bleeder) or blood transfusion is also taken to be major, whereas bleeds controllable by pressure, packing; or abdominal wall haematomas that do not require any additional manoeuvres can be classified as minor bleeds. Where faced with the possibility of injury to the aorta, vena cava or the iliac vessels, conversion to open surgery must be quick. It is in the interests of the patient if another consultant or colleague can be asked to join the surgery as soon as possible. The basic principles underlying the management of major-vessel injuries are, prompt control (packing, digital pressure, vascular clamps), isolation, dissection and repair. ,, Once the vessel has been identified and dissected, care must be taken to look at the posterior wall also to rule out a 'through and through' penetration injury. One must also always look for other associated injuries, injury to other vessels and injury at multiple sites on the same vessel. , Repair is usually straightforward, with primary repair being considered ideal, although ligation of the iliac veins has also been performed safely; however, if the damage is extensive, some form of grafting may be required. If the patient remains stable, one can then proceed with cholecystectomy; but in a patient who has bled extensively and is unstable, the procedure may have to be postponed. 1. Singh R, Kaushik R, Sharma R, Attri AK. Non-biliary mishaps during laparoscopic cholecystectomy. Ind J Gastroenterol 2004;23:47-9. 2. Phillips PA, Amaral JF. 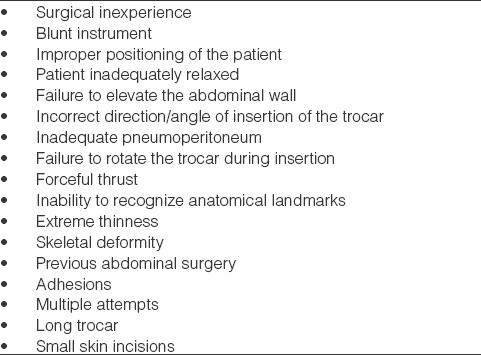 Abdominal access complications in laparoscopic surgery. J Am Coll Surg 2001;192:525-36. 3. Erol DD, Polat C, San O. The diagnosis and early treatment of acute hemorrhagic shock after laparoscopic cholecystectomy. Internet J Anaesthesiol 2005. p. 9. 4. Khan MW, Aziz MM. Experience in laparoscopic cholecystectomy. Mymensingh Med J 2010;19:77-84. 5. Tuveri M, Tuveri A. Laparoscopic Cholecystectomy: Complications and Conversions With the 3-Trocar Technique. A 10-year Review. Surg Laparosc Endosc Percutan Tech 2007;17:380-4. 6. Marakis G, Pavlidis TE, Aimoniotou E, Ballas K, Psarras K, Karvounaris D, et al. Major Complications During Laparoscopic Cholecystectomy. Int Surg 2007;92:142-6. 7. Vagenas K, Karamanakos SN, Spyropoulos C, Panagiotopoulos S, Karanikolas M, Stavropoulos M. Laparoscopic cholecystectomy: A report from a single center. World J Gastroenterol 2006;12:3887-90. 8. Ishizaki Y, Miwa K, Yoshimoto J, Sugo H, Kawasaki S. Conversion of elective laparoscopic to open cholecystectomy between 1993 and 2004. Br J Surg 2006;93:987-91. 9. Daradkeh S. Laparoscopic cholecystectomy: Analytical study of 1208 cases. Hepatogastroenterology 2005;52:1011-4. 10. Duca S, Bãlã O, Al-Hajjar N, Lancu C, Puia IC, Munteanu D, et al. Laparoscopic cholecystectomy: Incidents and complications. A retrospective analysis of 9542 consecutive laparoscopic operations. HPB (Oxford) 2003;5:152-8. 11. Kaushik R, Sharma R, Batra R, Yadav TD, Attri AK, Kaushik SP. Laparoscopic cholecystectomy: An Indian experience of 1233 cases. J Laparoendosc Adv Surg Tech A. 2002;12:21-5. 12. Bingener-Casey J, Richards ML, Strodel WE, Schwesinger WH, Sirinek KR. Reasons for conversion from laparoscopic to open cholecystectomy: A 10-year review. J Gastrointest Surg 2002;6:800-5. 13. Z'graggen K, Wehrli H, Metzger A, Buehler M, Frei E, Klaiber C. Complications of laparoscopic cholecystectomy in Switzerland. A prospective 3-year study of 10,174 patients. Swiss Association of Laparoscopic and Thoracoscopic Surgery. Surg Endosc 1998;12:1303-10. 14. Ihasz M, Regoly-Merei J, Fazekas T, Batorfi J, Balint A, Zaborszky A, et al. Complications of laparoscopic cholecystectomy in Hungary: A multicentre study of 13833 patients. Eur J Surg 1997;163:267-74. 15. Shea JA, Healey MJ, Berlin JA, Clarke JR, Malet PF, Staroscik RN, et al. Mortality and complications associated with laparoscopic cholecystectomy. A meta-analysis. Ann Surg 1996;224:609-20. 16. Ovaska J, Airo I, Haglund C, Kivilaakso E, Kiviluoto T, Palm J, et al. Laparoscopic cholecystectomy: The Finnish experience. Ann Chir Gynaecol 1996;85:208-11. 17. Wherry DC, Rob CG, Marohn MR, Rich NM. An external audit of laparoscopic cholecystectomy performed in medical treatment facilities of the department of Defense. Ann Surg 1994;220:626-34. 18. Croce E, Azzola M, Golia M, Russo R, Pompa C. Laparocholecystectomy. 6,865 cases from Italian institutions. Surg Endosc 1994;8:1088-91. 19. Deziel DJ. Complications of laparoscopic cholecystectomy: A national survey of 4,292 hospitals and an analysis of 77,604 cases. Am J Surg 1993;165:9-14. 20. Go PM, Schol F, Gouma DJ. Laparoscopic cholecystectomy in The Netherlands. Br J Surg 1993;80:1180-3. 21. Airan M, Appel M, Berci G, Coburg AJ, Cohen M, Cuschieri A, et al. Retrospective and prospective multi-institutional laparoscopic cholecystectomy study organized by the Society of American Gastrointestinal Endoscopic Surgeons. Surg Endosc 1992;6:169-78. 22. Scott TR, Zucker KA, Bailey RW. Laparoscopic cholecystectomy: A review of 12,397 patients. Surg Laparosc Endosc 1992;2:191-8. 23. Shamiyeh A, Wayand W. Laparoscopic cholecystectomy: Early and late complications and their treatment. Langenbecks Arch Surg 2004;389:164-71. 24. Schäfer M, Lauper M, Krähenbühl L. A nation's experience of bleeding complications during laparoscopy. Am J Surg 2000;180:73-7. 25. Nordestgaard AG, Bodily KC, Osborne RW Jr, Buttorff JD. Major vascular injuries during laparoscopic procedures. Am J Surg 1995;169:543-5. 26. Mases A, Montes A, Ramos R, Trillo L, Puig MM. Injury to the abdominal aorta during laparoscopic surgery: An unusual presentation. Anesth Analg 2000;91:561-2. 27. Opitz I, Gantert W, Giger U, Kocher T, Krahenbuhl L. Bleeding remains a major complication during laparoscopic surgery: Analysis of the SALTS database. Langenbeck's Arch Surg 2005;390:128-33. 28. Munro MG. Laparoscopic access: Complications, technologies and techniques. Curr Opin Obstet Gynecol 2002;14:365-74. 29. Bhoyrul S, Vierra MA, Nezhat CR, Krummel TM, Way LW. Trocar injuries in laparoscopic surgery. J Am Coll Surg 2001;192:677-83. 30. Dixon M, Carrillo EH. Iliac vascular injuries during elective laparoscopic surgery. Surg Endosc 1999;13:1230-3. 31. Ahmad G, Duffy JM, Watson AJ. Laparoscopic entry techniques and complications. Int J Gynaecol Obstet 2007;99:52-5. 32. Geraci G, Sciume C, Pisello F, Li Volsi F, Facella T, Modica G. Trocar-related abdominal wall bleeding in 200 patients after laparoscopic cholecystectomy: Personal experience. World J Gastroenterol 2006;12:7165-7. 33. Lee VS, Chari RS, Cucchiaro G. Complications of laparoscopic cholecystectomy. Am J Surg 1993;165:527-32. 34. Yerdel MA, Koksoy C, Aras N, Orita K. Laparoscopic versus open cholecystectomy in cirrhotic patients. Surg Laparoscop Endosc 1997;7:483-6. 35. Puggioni A, Wong LL. A metaanalysis of laparoscopic cholecystectomy in patients with cirrhosis. J Am Coll Surg 2003;197:921-6. 36. Gurusamy K, Samraj K, Gluud C, Wilson E, Davidson BR. Meta-analysis of randomized controlled trials on the safety and effectiveness of early versus delayed laparoscopic cholecystectomy for acute cholecystitis. Br J Surg 2010;97:141-50. 37. Abdullah AA. Laparoscopic cholecystectomy is feasible and safe in acute cholecystitis. Saudi J Gastroenterol 1999;5:56-6. 38. Hanney RM, Carmalt HL, Merrett N, Tait N. Use of the Hasson cannula producing major vascular injury at laparoscopy. Surg Endosc 1999;13:1238-40. 39. Tzovaras G, Dervenis C. Vascular injuries in laparoscopic cholecystectomy: An underestimated problem. Dig Surg 2006;23:370-4. 40. Usal H, Sayad P, Hayek N, Hallak A, Huie F, Ferzli G. Major vascular injuries during laparoscopic cholecystectomy. An institutional review of experience with 2589 procedures and literature review. Surg Endosc 1998;12:960-2. 41. Apelgren KN, Scheeres DE. Aortic injury. A catastrophic complication of laparoscopic cholecystectomy. Surg Endosc 1994;8:689-91.